Features: 100% Brand New. 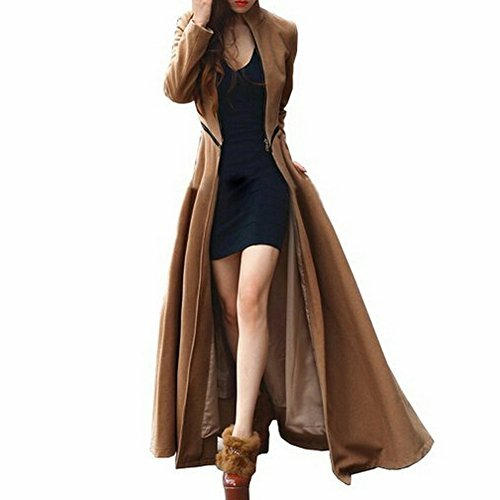 Long-sleeve style women's long trench coat with floor-length hem 4 beautiful colors available:Khaki,Grey,Black,and Blue Package:1*Women's Coat Measurement: Asian M:(US S(4),UK 6,AU 8),Chest 35.1in,Shoulder 14.8in,Sleeve 22.6in,Full Length 48.0in Asian L:(US M(8-10),UK 10,AU 12),Chest 35.9in,Shoulder 15.2in,Sleeve 23.0in,Full Length 48.4in Asian XL:(US L(12),UK 14,AU 16),Chest 36.7in,Shoulder 15.6in,Sleeve 23.4in,Full Length 48.8in Asian XXL:(US XL(16),UK 18, AU 20),Chest 37.4in,Shoulder 16.0in,Sleeve 23.8in,Full Length 49.1in Please Note:As different computers display colors variously, the color of the actual item may vary slightly from the above images.There may be minor inevitable measured deviations,but they are acceptable.Thanks for your understanding. 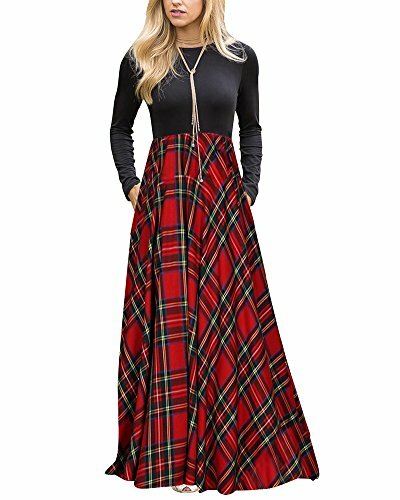 LEANI Women's Long Sleeve Plaid High Waist Floor Length Pleated Maxi Dress with Pockets Unique and romatic, adds an eye-catching style to your wardrobe. Features: Sleeve: Long Sleeve Neckline: Crew neck Fabric: Lightweight, soft and stretchy Design: Solid top matches plaid maxi dress Length: Floor length, can cover the feet Pocket: Two pockets beside hip Washing Instruction: - Machine or hand wash recommend - hang to dry in shade, prohibit bleaching. Notes: - Please check the measurement chart carefully before you buy the item. - Please allow a little error due to measurement method is different .Color differences allowed for light effects. - There maybe 0.39-0.79 inch deviation in different sizes, locations and stretch of fabrics. 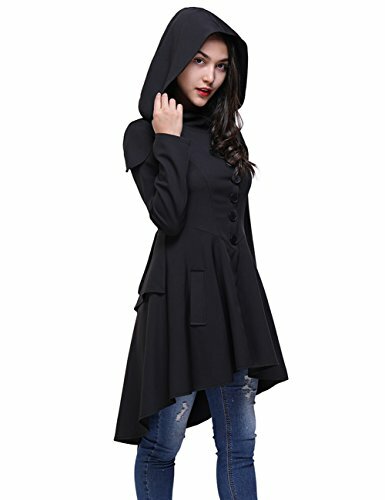 Material: Polyester, Spandex Long Sleeve, Button Up, High Low Hem, Side Pockets, Layered Peplum Bottom and Lace-Up at Back, Comfortable, Hooded Coat The Products without the Trademark is Counterfeit. Garment Care: Machine washable / Hand wash recommended / Do not bleach We promise all of them are in the good quality. If you are not satisfied with it, we will give you a full 100% money back guarantee. If you are satisfied with our product, pls. give us feedback and let other customers to know how good the product is. If our product is unsatisfactory, pls. do not hesitate to let us know, we'll do our best to improve the quality and services based on customer's feedback. About Color: Due to monitor settings, monitor pixel definitions, we cannot guarantee that the color you see on your screen as an exact color of the product. About size: Pls get measured before placing an order. Tag size is Asian size, which runs much smaller than US/CA size, the size chart gives the corresponding US/CA size for your reference. 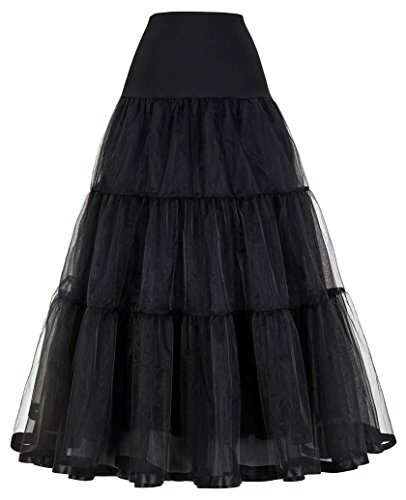 If you run between sizes and are not sure what size to get, we would suggest going up a size. 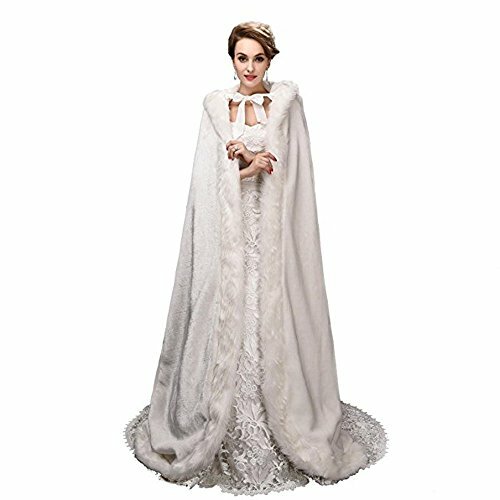 Specification: *Fabric:100% Grade A High quality Faux Fur *Color: Ivory *It's a good choice for daily life and special occasion, such as parties, wedding, pageant, performance, photography and evening. *It's a good Christmas/Birthday/Holiday gift for your sisters, friends and yourself. Note: * Please allow 1-2cm errors due to manual measurement. * The color maybe a little difference compare the image with actual item due to monitor reflect, please understanding Thanks! *If any question, send us message, we are keeping in touch with you. 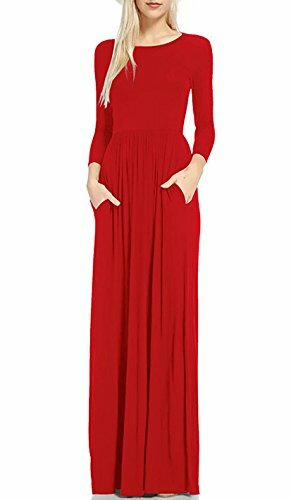 ★Package include: ★1PC Women Dress★Size Detail:★️Size:MBust:94cm/37"Sleeve:62cm/24.4"Shoulder:38cm/15"Waist:70cm/27.6"Back Length:130cm/51.2" ★️Size:LBust:98cm/38.6"Sleeve:63cm/24.8"Shoulder:39cm/15.4"Waist:74cm/29.1"Back Length:132cm/52" ★️Size:XLBust:102cm/40.2"Sleeve:64cm/25..2"Shoulder:40cm/15.7"Waist:78cm/30.7"Back Length:134cm/52.8" ★️Size:XXLBust:106cm/41.7"Sleeve:65cm/25.6"Shoulder:41cm/16.1"Waist:82cm/32.3"Back Length:136cm/53.5" ★️Size:XXXLBust:110cm/43.3"Sleeve:66cm/26"Shoulder:42cm/16.5"Waist:86cm/33.9"Back Length:138cm/54.3" ★Features: ★-Please allow 1-2cm measuring deviation due to manual measurement. ★- Please check the Size Chart before order. If you are not sure the size, please send message to us. Description:Material:cotton,polyester blend, soft, comfortable, stretch.Short sleeve, flowy swing maxi dress, solid color.Simple design maxi dress for women, suit for dressing up with choker,heel coat, or wear this dress alone to everywhere.Short sleeve style, suit for spring, summer,fall.Machine wash cold with like colors, gentle cycle, line dry, do not bleach, do not iron.Specification:Gender:Women.Sleeve length:short.Style:casual.Material:cotton,polyester.Pattern type:pure color.Color:show as picture.Neck:round neck.Size Table:Size Bust Sleeve Length WeightS 85 11.5 140 440 M 90 12 141 450 L 95 12.5 142 460 XL 100 13 143 470 2XL 105 13.5 144 480 Notes:There is 2-3cm difference according to manual measurement. please check the measurement chart carefully before you buy the item.Due to different display settings, the color of real item may slightly different from the picture show.package include:1 * women pure color long dress. 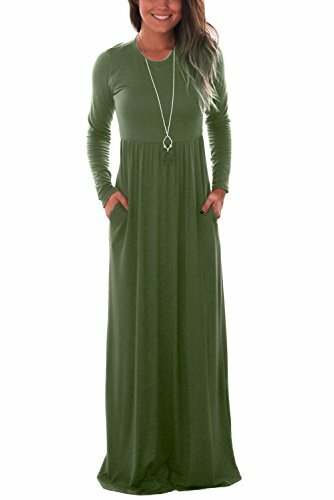 Dawnraid Womens Casual Long Sleeve Maxi Dresses with Pockets Fits Season:Spring,Fall,Winter Fits Occassion:Party,Wedding,Casual,Culb,Night Out Features:Casual Style,Two Side Pockets,Long Sleeves,Round Neck,Floor Length,Elastic Waist,Maxi Dresses,Pleated Hem Dress Type:Long Maxi Dress Pattern Type:Plain/Simple Solid Color Dress Fabric Type:95% Cotton+5% Spandex, Soft and Comfy Garment Care:Hand wash cold and hang dry. 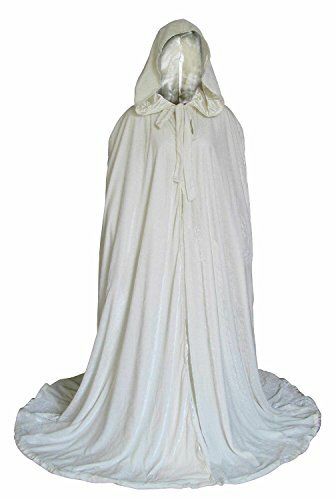 Size Details(1 inch= 2.54cm): Size S:Bust:33"-35"---Waist:26"-28"---Hip:41"-43"---Length:53.3" Size M:Bust:35"-37"---Waist:28"-30"---Hip:43"-45"---Length:53.6" Size L:Bust:37"-39"---Waist:30"-32"---Hip:45"-47"---Length:54.1" Size XL:Bust:39"-41"---Waist:32"-34"---Hip:47"-49"---Length:54.4" Size XXL:Bust:41"-43"---Waist:34"-36"---Hip:49"-51"---Length:54.8" Please check our size chart before purchase. 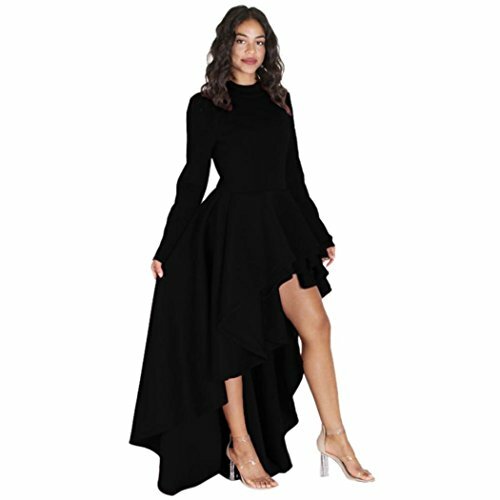 Compare prices on Floor Length Dress Coat at ShoppinGent.com – use promo codes and coupons for best offers and deals. Start smart buying with ShoppinGent.com right now and choose your golden price on every purchase.